Our Glamour collection has been on our books for many years now and is really popular with couples. It is made with luxurious lace, a large satin bow and finished with a sparkly, diamante embellishment. The inside of the invite has a coloured backing card to match the ribbon. 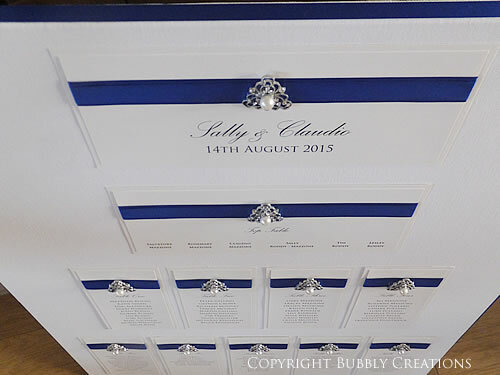 Caroline and Nicholas got in contact as they loved the sparkly side of the Glamour design and wanted a table plan and matching place cards made. 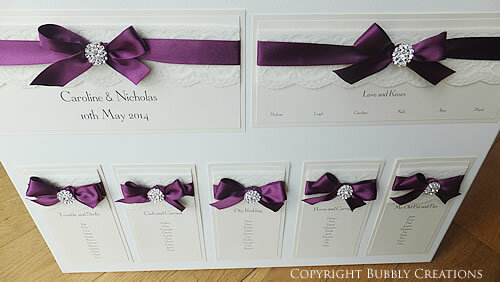 They chose to have ivory card and a dark purple, aubergine ribbon which really showed off the embellishment. They needed a table plan for five tables plus the top table so our small plan (up to eight tables plus the top) was perfect. They liked the landscape style with the header and top table at the top and one row of five tables underneath. We also made matching place cards. 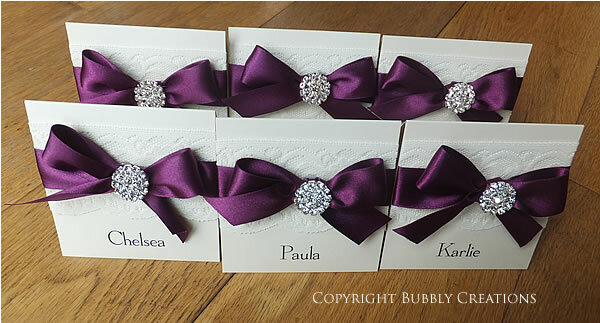 These are folded cards measuring 10 x 10 cm with the guest name printed and lace, the satin ribbon bow and diamante embellishment. 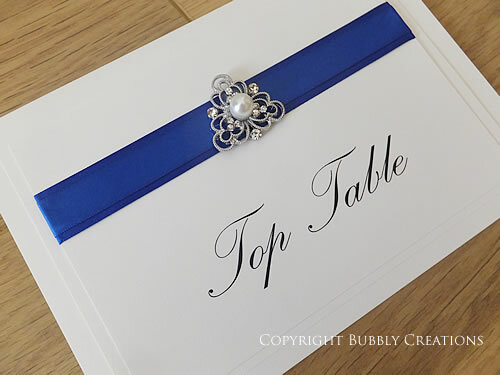 We can also provide wedding invitations in this design using any colour ribbon. 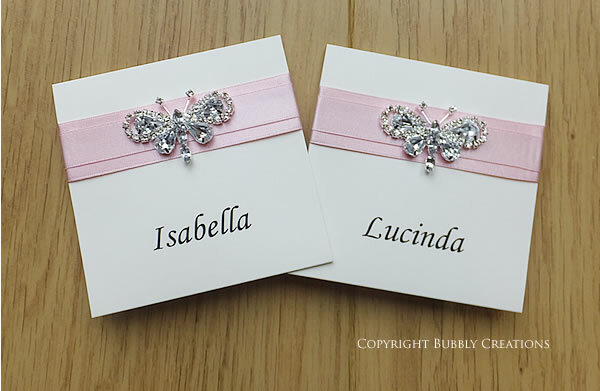 Our Crystal Butterfly collection has been on our books for many years now and is really popular with couples getting married in the spring or summer. It is a classic and elegant design with a double layer of satin ribbon and finished with a large, sparkly diamante butterfly embellishment. 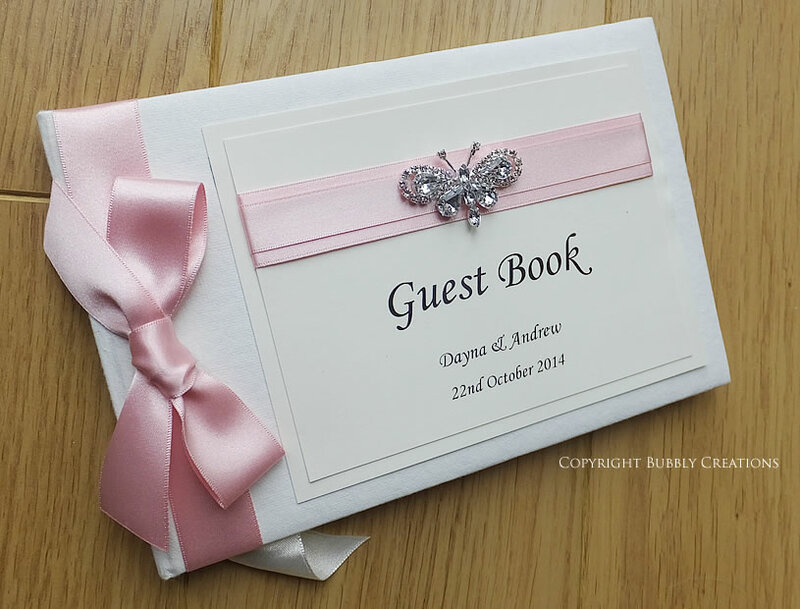 There is also matching pink card used on the inside to bring the design together. 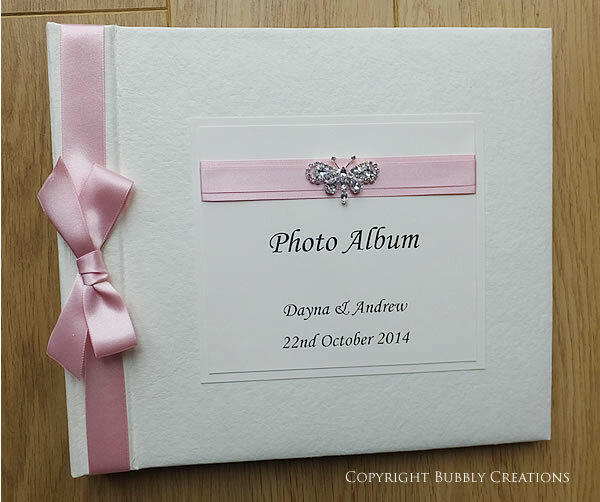 We offer flexibility on all of our designs and the embellishment and ribbon colour can both be changed to suit. We have used this same design for our Winter Wonderland collection with a large sparkly snowflake and our Filigree with a beautiful pearl and diamante embellishment. Dayna and Andrew contacted us all the way from Australia to ask us to make a full package of wedding stationery for their wedding in October. 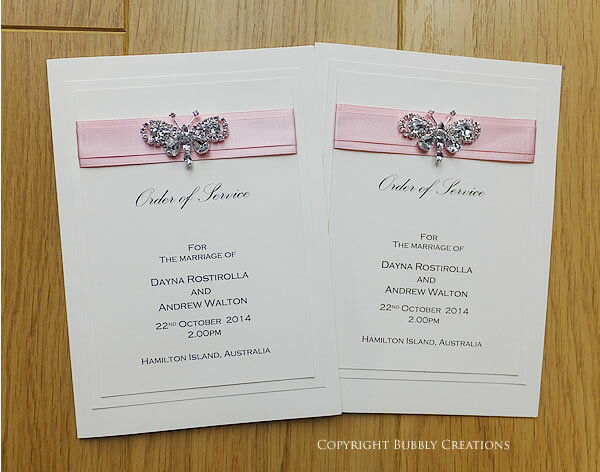 They chose to have our Crystal Butterfly collection using a rose pink satin ribbon. We worked on their pocket wedding invitations previously in the year and started work on their on the day stationery around September. 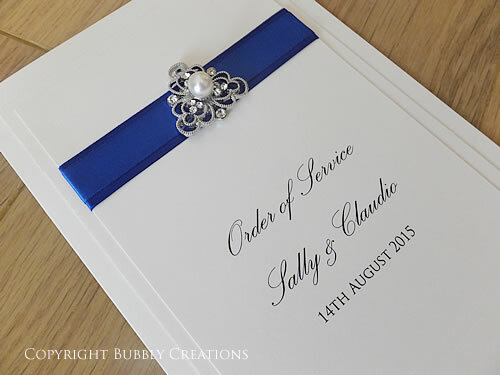 They chose to order Order of Service booklets, matching place cards, a guest book and photo album.